You'll be £19.99 closer to your next £10.00 credit when you purchase The German Offensives of 1918. What's this? Few pivotal years in history are less understood than that of 1918. It was a momentous period, which began with Germany's desperate gamble to win the Great War through a sequence of offensives on the Western Front. Ian Passingham's graphic new study draws on a wide range of original German, British and French sources, and it features previously unpublished eyewitness accounts and photographs. He boldly reassesses German military doctrine, the strategic thinking behind the offensives and the effectiveness of the stormtroop tactics used. He also considers how the poor state of German military morale and the privations and unrest of the German people contributed to the army's defeat. Written in a pacy, easy style that glides along to provide sufficient information without delving into too much detail, the narrative is punctuated by the extensive use of first hand accounts to give a flavour of the fighting at ground level, together with analyses along the way highlighting the key issues to be considered in judging the impact of the campaigns and the command decisions taken. 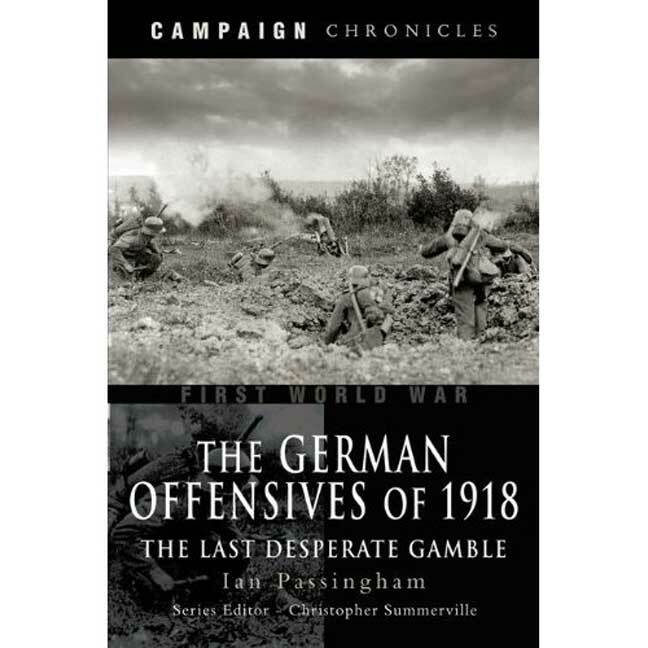 The whole of 1918 proved to be momentous as Germany began its last desperate gamble to win the war through a sequence of offensives on the Western Front. The first of these was launched in March, on the Somme, against the British, and seemed set to achieve a swift and decisive victory. But stubborn resistance led to German failure and by August they were both exhausted and disillusioned. This work draws on a wide range of original German, British and French sources, featuring previously unpublished eyewitness accounts and photographs. First class work. 10/10.